(C) The claims and statement of invention are generally taken as they read; however, claims must be read in light of the disclosure (claimed disclosure). Any attempt to go behind the record and decide the case upon what is deemed the "real invention" would, it is believed, introduce more errors than such action would cure. Supervisory patent examiners (SPEs) cannot possess the specific knowledge of the state of the art in all the classes that the patent examiners collectively possess. Further, such questions are matters of merit for the examiners to determine and are often open to argument and are subject for appeal. Thus, in cases where there is a claim drawn to hybrid or mixed subject matter and the SPE in one discipline determines that the application requires consideration by, or may be best examined by, a TC in one of the other technical disciplines, chemical, electrical, or mechanical, he or she may request a transfer of the application on a "best examinable" basis, in accordance with this subsection. As indicated earlier, when an application which had been assigned for examination in accordance with this subsection ultimately is allowed, it will be classified according to the controlling claim. In effect, assignment for examination may be on a "best examinable" basis, but the patent will issue and be classified according to the rules of superiority in classification; thus, the search file will have a constant set of rules governing placement of patents therein. Where an application is being reassigned from one examining discipline to another, under the provisions of the "best examinable" practice, the person requesting the transfer is ordinarily required to cite references pertinent to the claimed features falling under the jurisdiction of the art within his or her discipline. In those cases wherein the application of the reference(s) is not evident or clear, the transferring examiner should include a brief statement explaining the relation and possible application of the reference(s) to the claim(s); in case of dispute as to the necessity of this procedure, the classification dispute TC representative panel has power to require the statement. (H) When an application has been taken up by an examiner for action and a requirement to restrict is found necessary, a part of the claims being directed to matter classifiable in the TC where the case is being examined, an action requiring restriction should be made without seeking a transfer of the case to another TC. The action of the applicant in reply to the requirement for restriction may result in making a transfer of the application unnecessary. (I) Ordinarily, where all the claims of an application are for an article made of a specific composition or alloy with no other structure of the article recited, the application will be assigned to the composition or alloy class. (J) A class of cases exists in which either no art or a divided art is found and in which no rule or principle is involved. Such cases are placed where, in the judgment of the classification TC representative panel, they will be best searched and adjudicated. It is often impossible to so explain a decision in this class of cases as to satisfy, or in any way aid, the examiners interested. Indeed, the reasons for or against sending such cases one place or another may be so evenly balanced that no reason of any value can be given. (K) An examiner seeking the transfer of a case may make a search, both of his or her own class and the class to which he or she thinks the case should be transferred, and the examiner in charge of the art unit should ensure the record includes the result of the search. 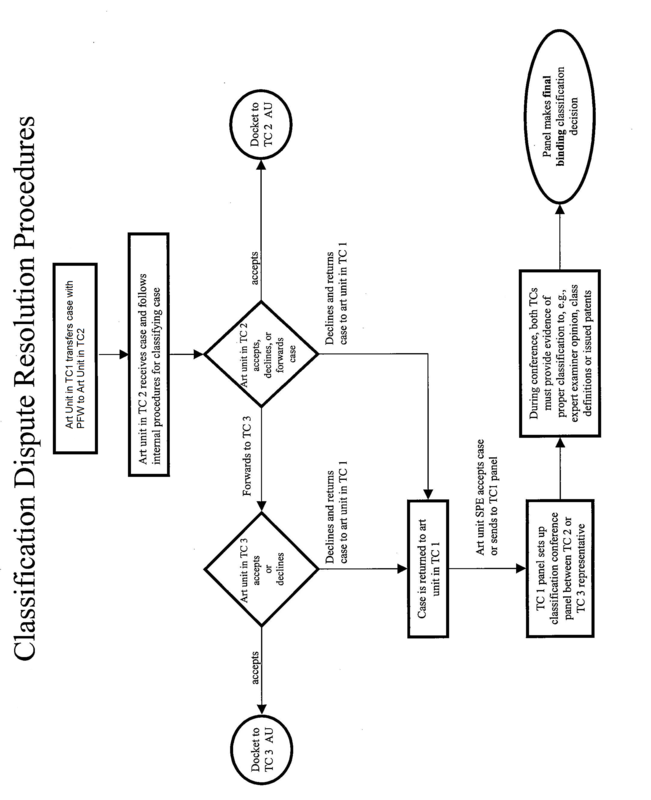 (L) When an application is received by the classification dispute TC representative panel in which there is a matter under dispute which is not related to the classification of a claim but which is in the purview of the TCs, e.g., propriety of a restriction requirement, timeliness of submission for transfer, etc., as well as a dispute over the classification of claims, the application will be returned to the originating TC for resolution on the issues unrelated to the classification. The flowchart below shows the routing of an application between TCs. (For routing of applications between art units within the same TC, see MPEP § 903.08(d).) The application should be considered by the receiving art unit in the TC (TC1), which will accept the application and assign it to an examiner, or forward it to an art unit in another TC (TC2) for consideration. An art unit in TC2 will classify and assign the application to an examiner, return the application to the SPE of the originating art unit, or forward it to an art unit in another TC (TC3). If the art unit in TC2 is not aware of any other likely classification, the application may be returned directly to the SPE of the originating art unit in TC1. In any of these scenarios, the decisions concerning the transfer must be recorded in Patent File Wrapper (PFW). SPEs and examiners must use the Patent File Wrapper (PFW) Transfer Inquiry function, which creates a record of the transfer inquiry history of each application and facilitates tracking of applications.